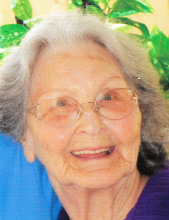 Juanita Grace Rutherford, 92, passed away Monday, April 1, 2019, in Haskell, Texas. A Funeral Service will be held 10 am, Wednesday April 3, 2019 at the at the First Assembly of God with Bro. Carl Amburn officiating. Burial will follow at 3:30 pm, in Whitt Cemetery in Whitt, TX. A visitation will be held Tuesday evening from 6:00 – 8:00 pm at Haskell Funeral Home, 2 Avenue D. Condolences may be made at www.haskellfuneralhometx.com. Juanita was born February 10, 1927 in Ballinger, Texas to William Ernest and Ethel Caroline Bennett Beatty. She married Calvin Fremont Rutherford. Juanita was a member of Abundant Life Assembly of God Church in Whitt, Texas for 22 years, New Beginning Church in Paris, Texas for 10 years and First Assembly of God Church in Haskell, Texas for 3 years. She was preceded in death by her parents, William and Ethel Beatty; husband, Calvin Rutherford; daughter, Darlene Louise Nielson Quillin; grandson, Richard Lee David Mayo; sisters, Ethel Caroline Beatty Lansing Jean, Mary Josephine Beatty Wolf; and brothers, William Ernest Beatty, Jr., John J. Beatty, William (Maury) Beatty, Robert Lee Beatty, and Gabriel (Gabe) Beatty. To send flowers or a remembrance gift to the family of Juanita Grace Rutherford, please visit our Tribute Store. "Email Address" would like to share the life celebration of Juanita Grace Rutherford. Click on the "link" to go to share a favorite memory or leave a condolence message for the family.